If Merkel and all other European leaders and their governments had any interest in acknowledging the reality on the ground in Israel/Palestine they would refrain from describing the attacks by individual Palestinians on Israeli Jews over recent months as terrorism. To qualify as an act of terrorism an attack has to be motivated/driven by the need and determination to achieve a political goal. In the case of the Palestinians that would be ending Israel’s occupation and securing an acceptable amount of justice. That has not been the motivation or drive of any of the Palestinians who have attacked and sometimes killed Israeli Jews in recent months. The attacks were and still are motivated/driven by total despair – the abandonment by individuals of all hope for an end to Israel’s on-going and ever-expanding colonization of the occupied West Bank and all it means of terms of the theft of more and more Palestinian land and water and the destruction of more and more Palestinian homes. In other words, the individual Palestinian attacks on Israeli Jews over recent months are best (most accurately) described as understandable responses to Israel’s brutal repression. 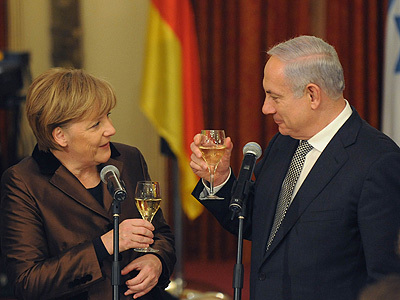 My other reason for describing Merkel’s words as disingenuous is that she knows, as all other European leaders and their governments know, that the two-state solution is dead, killed by Israel’s on-going colonization of the occupied west Bank. All Western leaders also know that even if they summoned up the will to use the leverage they have to try to cause Israel to agree to bring the concept of a two-state solution back to life as the way to peace, there could never be such a solution to the conflict because no Israeli government is ever going to initiate a Jewish civil war to make the space for a viable Palestinian mini state. The problem for all European leaders and the American president (Obama at present and whoever succeeds him after the November election) is that they can’t acknowledge that the two-state solution is dead because to do so would leave them with only two options. The other would be to say (as Obama has said more than once) that they can’t want peace more than the parties themselves; and that, of course, would be the cover for indicating without saying so that they were washing their hands of Palestine and leaving the fate of its Arabs to be determined by Zionism. On the subject of the Cameron government’s decision to make boycotting goods from Israeli settlements in the occupied West Bank by publicly-funded bodies a criminal offence, I agree with a comment made by Glenn Greenwald in a recent article. Cameron was, he wrote, playing his part in a very co-ordinated and well-financed campaign led by Israel and its supporters to destroy the Boycott, Sanctions and Divestment (BDS) movement. (In Jerusalem on 15 February, at the annual conference of Presidents of Major Jewish Organizations, retired Israeli Brigadier General Yossi Kuperwasser described BDS as “anti-Semitism” and “terrorism.” I imagine he’s deluded enough to regard all and any criticism of Israel’s policies and actions as both). Hillary Clinton, still it seems the most likely next president of America, has been advancing this Zionist campaign to de-legitimize and outlaw the BDS movement for many months. There is actually a great and little known truth hidden behind those words. It is to do with the real reason why Israel possesses nuclear weapons. As I explain in detail in my book Zionism: The Real Enemy of the Jews, those Israeli leaders who insisted that anything should be done to enable their state to possess and develop nuclear weapons never believed they were necessary as a part of Israel’s defense against the Arabs. (In fact Ariel Sharon was the leader of those who were opposed to Israel acquiring nuclear weapons. Behind closed doors he argued that if Israel had them, the Arabs at some point would also acquire them. And if that happened, he said, Israel’s ability to impose its will on the Arabs with conventional/non-nuclear weapons would be seriously compromised). The possession of nuclear weapons is Zionism’s ultimate blackmail card. That was indicated to me in 1969 by Moshe Dayan, Israel’s one-eyed warlord. He assumed that a day would come when just about the whole world, governments as well as peoples, was fed up with Israel and would subject it to immense and possibly irresistible pressure to end its defiance of international law and denial of justice for the Palestinians. (Three days before Israel went to war in June 1967 I asked him what he thought the coming days would bring. He smiled, made a gesture with a finger to illustrate what he was about to say, then, directly to the camera, he said, “The desert is beckoning.” That told me Israel was about to strike. In a report to ITN on the evening of Sunday 4 June I speculated that Israel would go to war the following morning. It did. And that’s why I had no problem believing what Dayan indicated to me in 1969). The conclusion I draw from everything I have learned from nearly half a century of engagement in various capacities with the conflict in and over Palestine that became Israel is that there are two main reasons for the refusal of the major Western powers to confront Zionism in order to provide the Palestinians with an acceptable amount of justice..
One is the influence (declining a little but still awesome) that the Zionist lobby in all of its manifestations has in the corridors of power together with unlimited funds to buy politicians. The other is fear that if pushed further than they were prepared to go, Israel’s leaders would press a nuclear button or two and more if needed. To those who are clinging to the hope that Europe will take the lead in pressing Israel to be serious about peace on terms the Palestinians could accept I say – It won’t happen. The real problem for all European leaders and the American president(s), as well as the controllers of all the mainstream media in their respective countries, is where Israel is concerned, they seem to act as if they were executive functionaries of a higher authority that dictates policy! They all comply without any hesitation no matter how inhumanly barbaric is Israel's behaviour or excesses in its criminality. The power this invisible 'higher authority' exercises can be best summed up by the infamous words of Mayer Amschel Rothschild who said: "Give me control of a nation's money and I care not who makes the laws." against imperialism, zionism and oppression of the Palestinian people. "“anti-Semitism” and “terrorism.” I imagine he’s deluded enough to regard all and any criticism of Israel’s policies and actions as both)"
Disgracefully, this Kuperwasser is not the only deluded. A seasoned political analyst in Venezuela called me anti semite (and stupid) for my critic to the bombing of Gaza (and blocked me in twitter); and that is a widespread attitude even in a place so far away (in all senses) as Venezuela. The Zionist propaganda and brainwashing is very effective. Will the alliance of : China, Russia & Iran. Bow down to the Zionest desires of continuing expanding land borders. And will developer Trump just smile, As he sends our Finest, to support Hell ? Gen. Ariel Sharon was wrong. A nuclear Israel never bothered the Western-installed and supported Arab regime. They only woke-up when they heard Netanyahu's lies about Iran's non-existent nuclear bomb. The Arab rulers' attitude was rightfully described by Lebanon's Sunni scholar Sheikh Maher Hammoud. He said in 2014: "If you want Arabs to fight Israel, tell them Israel converted to Shi’ism”. It is True that Money Greasing the Right Persons' Palms Does Work ..For a While. And TRUE that There Are Many Double-Dealers Residing Right here..In Our Government, no less ! Who Have no allegiance, so to speak of, to any one of the two Duel-Citizenships They Hold. ( Their God is Money And The ""Power ? It Brings. Add to This The Aspect of FEAR..And you do have a Powerful Alliance. This "Situation has been Going on Ever since The "" First Arab Was Moved off his Land To accommodate This Place That's` been named ISITREAL..In the Forties !>>( which Was Planned FOR..A Long While Before That... In the Beginning It Must have Seemed to be The perfect Solution For These Jews who Had no Place Of their Own To call Home. But, Didn`t take long before Their Acquisitive Nature Got the Best of Them ( AS They So intended..From Day One. ! However. I have a suspicion, That Soon, The "threat of A Nuclear State Will not Be enough to Stave Off Dire Retaliations Against these Insidious Zionist Who Are simply insatiable Creatures that Eventually are going to Have to be >>Brought Down. They Are Not Prepared to Fight the Whole World. They Are only Prepared to destroy More and more Lives..And Take What ever they Desire..But ..That Time is Close at Hand That No one is Going to BE Prepared TO let These Things Go on.. To Continue Trying to Co-exist with Monsters of the Worst Order is not at all feasible. Sometimes.. It is Better TO Stop This At Any Cost. God Bless These poor Palestinians Hemmed UP In Gaza..With No Way TO Fight back. Something IS Going TO Happen That Will Blow IT All Up. And These Zionist Will be The Very First to Go. I See it Comong. Don`t you ?? It is True that Money Greasing the Right Persons' Palms Does Work ..For a While. And TRUE that There Are Many Double-Dealers Residing Right here..In Our Government, no less ! Who Have no allegiance, so to speak of, to any one of the two Duel-Citizenships They Hold. ( Their God is Money And The ""Power ? It Brings. Add to This The Aspect of FEAR..And you do have a Powerful Alliance. This "Situation has been Going on Ever since The "" First Arab Was Moved off his Land To accommodate This Place That's` been named ISITREAL..In the Forties !>>( which Was Planned FOR..A Long While Before That... In the Beginning It Must have Seemed to be The perfect Solution For These Jews who Had no Place Of their Own To call Home. But, Didn`t take long before Their Acquisitive Nature Got the Best of Them ( AS They So intended..From Day One. ! However. I have a suspicion, That Soon, The "threat of A Nuclear State Will not Be enough to Stave Off Dire Retaliations Against these Insidious Zionist Who Are simply insatiable Creatures that Eventually are going to Have to be >>Brought Down. They Are Not Prepared to Fight the Whole World. They Are only Prepared to destroy More and more Lives..And Take What ever they Desire..But ..That Time is Close at Hand That No one is Going to BE Prepared TO let These Things Go on.. To Continue Trying to Co-exist with Monsters of the Worst Order is not at all feasible. Sometimes.. It is Better TO Stop This At Any Cost. God Bless These poor Palestinians Hemmed UP In Gaza..With No Way TO Fight back. Something IS Going TO Happen That Will Blow IT All Up. And These Zionist Will be The Very First to Go. I See it Coming. Don`t you ?? In light of Golda Meir's response to Mr Alan Hart in the BBC Panorama programme, would I be right in saying that she was referring to another of Israel's 'defence strategy' known as 'The Samson Option'? Political Zionism against Radical Islam aided by the apostasy of 'Christian Zionism' is heading for an apocalyptic scenario it seems. So in terms of Golda Meir's rather psychopathic response, it resonates with the eschatology but eschatology that was the project of Zionism. The Rothschilds control a lot of global politics, religion and economics including the mass media. The Federal Reserve is controlled by Zionists. The Middle East seems to be about the petrodollar and the insane refusal to give it up because it would destroy the American economy. My point? Interpretation of Zionism is fundamentally theological as well as political, this is why Zionism infiltrated the Christian Church via Scofield's reference Bible (via the Zionist Lotus Club in New York in the late 19th century)> If the Protocols of the Learned Elders of Zion is valid, then the current scenario was planned along time ago. I apologise Mr Hart if this is too verbose or overly partisan. I salute your courage in speaking out against those who really control the world....Political Zionists.